In this Oct. 16, 2018 file photo, New England Patriots owner Robert Kraft arrives for the NFL football fall meetings in New York. On Wednesday, Jan. 9, 2019, Kraft was awarded Israel's 2019 Genesis Prize, a $1 million recognition widely known as the "Jewish Nobel Prize." 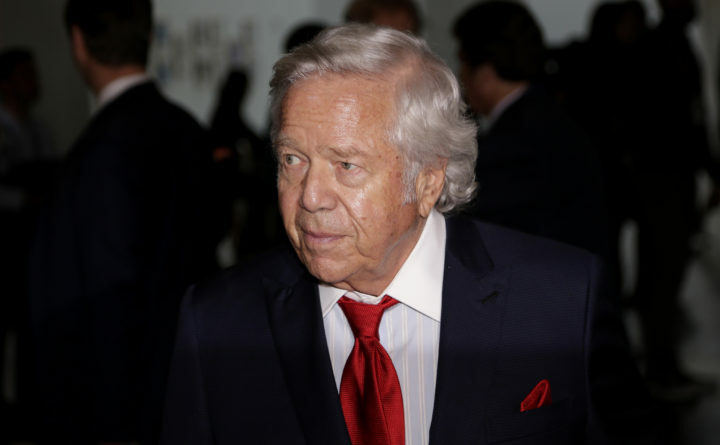 JERUSALEM — New England Patriots owner Robert Kraft has been awarded Israel’s 2019 Genesis Prize in recognition of his philanthropy and commitment to combatting anti-Semitism, organizers of the prize announced on Wednesday. Kraft, who grew up in an observant Jewish home, has been an outspoken supporter of Israel and has arranged trips for NFL Hall of Famers to the Holy Land. His prize money will be donated to initiatives combatting anti-Semitism, other forms of prejudices and what some portray as attempts to delegitimize Israel. Last year’s winner, Natalie Portman, snubbed the event because she did not want to appear to be endorsing Netanyahu. The decision sparked an angry backlash from some Israeli politicians with others warning that her move was a distressing sign of eroding support for Israel among young American Jews. There seems to be no such worry of a repeat snub from Kraft. The 77-year-old billionaire from Brookline, Massachusetts, is a longtime supporter of Israel, has donated to various causes there and is close to Netanyahu. Though a Democrat, he is also friendly with President Donald Trump. “Kraft has spent most of his life advocating for a more just society, tolerance and inclusiveness. He is one of the world’s most generous philanthropists whose charitable giving reflects the Jewish value of tikkun olam — repairing the world,” said Stan Polovets, co-Founder and Chairman of The Genesis Prize Foundation. “Our foundation looks forward to working with Robert and leveraging the power of sports to combat anti-Semitism and other forms of hate and prejudice,” he said. Kraft is the founder, chairman and CEO of the Kraft Group, the holding company of the Kraft family’s diversified portfolio of businesses, which includes one of the largest privately-owned paper and packaging conglomerates in the world. He derives his fame, however, from owning the five-time Super Bowl champion Patriots, one of the most successful franchises in American sports. He’s also primarily responsible for the growth of American football in Israel in recent years. He’s sponsored the sport since it was launched in 1999, and there are now more than 2,000 active players on more than 80 teams playing at various levels. In 2017, he dedicated the Kraft Sports Complex in Jerusalem that includes Israel’s first full-sized football field. The visit coincided with his second mission to bring Pro Football Hall of Fame players to Israel, where the game has resonated with native-born Israelis who have taken a liking to the army-like strategy, camaraderie and collisions. The trip included Joe Montana, Jim Brown, Roger Staubach, Mike Singletary and other legendary former players. Tom Brady and other Patriots stars have also visited over the years. Kraft also owns the New England Revolution of Major League Soccer. As part of the efforts for which he is being rewarded, the team will be hosting FC Chelsea at Gillette Stadium in May as part of the “Say no to anti-Semitism” campaign. The Genesis Prize was inaugurated in 2014 and is run in a partnership between the Israeli prime minister’s office, the private Genesis Prize Foundation and the chairman’s office of the Jewish Agency, a nonprofit group with close ties to the Israeli government. It is funded by a $100 million endowment established by the foundation. Kraft is the sixth winner of the prize, following Portman, former New York City Mayor Michael Bloomberg, actor Michael Douglas, violinist Itzhak Perlman and sculptor Anish Kapoor. U.S. Supreme Court Justice Ruth Bader Ginsburg has been granted the foundation’s only lifetime achievement award.